With the children’s choir of St. Maximilian Kolbe Parish at the National Shrine of the Immaculate Conception, Washington, D.C. The St. John Choir leads the assembly in acclamations, responses, and hymns weekly at the 9:30 a.m. Mass and for feast day Masses throughout the year. Rehearsals are 7:00-8:30p.m. on Wednesdays from September to May. Cantors lead the assembly’s song and psalmists proclaim the Word at the Responsorial Psalm weekly at all Masses. Significant vocal experience and a pliant voice style are standard requirements for this ministry. Those interested in serving as a cantor and psalmist should arrange an audition by calling the Music Office. The Praise Ensemble leads music at the Saturday 5 p.m. Mass weekly, and the Christmas Eve 5:30 p.m. Mass, The Ensemble leads the assembly in contemporary Catholic and contemporary Christian music for liturgy, along with contemporary arrangements of traditional tunes. Rehearsals will begin at 4:00 PM in Church on Saturdays. Founded in 2003, the St. John Youth Chorus sings for one Mass a month, the Christmas 3 p.m. Mass, and other parish events. Membership is open to children in 3rd-8th grade. 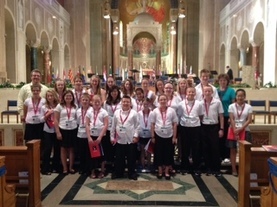 In addition to their ministry at St. John, the choristers have sung for the opening prayer service of the National Pastoral Musicians Convention in Chicago, IL, and choral festivals at Catholic cathedrals in Cincinnati (St. Peter-in-Chains) and Washington, D.C. (St. Matthew the Apostle, National Shrine of the Immaculate Conception). Rehearsals are Tuesdays 5:30 to 6:15 p.m. . Founded in 2007, the St. John Bell Choir provides music for one Mass a month and for Holy Days of the Church Year. Rehearsals are Tuesdays from 7:30-9 p.m. from September-May. The choir uses the parish’s 3-octave Schulmerich handbell set and 3-octave set of tone chimes. Parish instrumentalists enhance the liturgy through playing hymns and service music with our assembly, as well as occasional solo and ensemble selections. All parishioners ages 14+ are invited to play instruments for Mass. At least two years of lessons or band ensemble experience required. Musicians and singers 8th grade and up are invited to provide music for the 11:30 Sunday morning Mass. Rehearsals will begin at 10:30 AM in church. If you are interested in joining any of St. John’s Music groups, please contact Lynn Meisberger at lmeisberger@stjohnwc.org or call the parish office at 513-777-6433 X 128, or stop up after Mass!